Hi everyone, it's officially Fall and I love this time of year. It seems to not last long though around here. Our summer has extended itself all of a sudden and next thing you know it will be freezing! Such is the life of a Kansan though! I have some Fall cards to share with you today. My first are made from Karen Lockhart's Itty Bitty Scarecrow. I just *love* scarecrows. They have such happy faces. It's been ages since I've seen a real scarecrow though, maybe I need to revive that tradition in our garden. Plus I love the Wizard of Oz so I think it would be fitting to have a scarecrow in Kansas, don't ya think? Images were colored with Copic markers. The Sketch tips really work great getting into those tiny detailed areas of Karen's stamps. 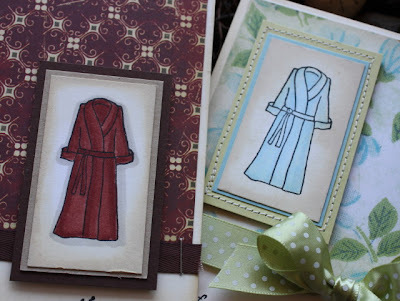 I cut and embossed the image and also layered them onto square Spellbinders Nestabilities Dies. That extra detail adds just the right amount of texture to make the images pop off the page. 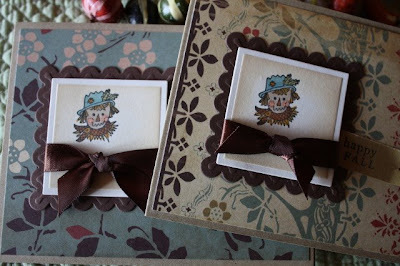 I tied my images up with Papertrey Satin Chocolate Ribbon and then adhered them to my card fronts. Patterned paper is by Cosmo Cricket, they have some of my most favorite collections of papers. 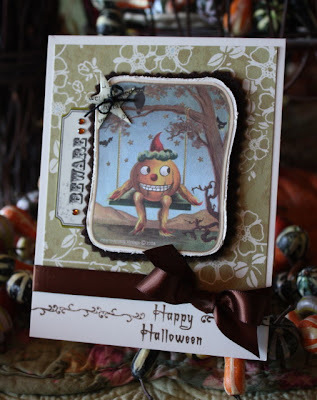 And here's some Halloween cards I made using the Crafty Secrets Journaling and Images Booklets. They make for easy peasy cards for sure! I added all kinds of little tags and labels from Making Memories, and some sticker sequins too. Background papers on both cards are from Webster's Pages. I love that these Fall looking papers lend more of a Fall theme rather than being bright and bold Halloween colors. Hope you all have a stellar day! It's nice and *crisp* here this morning, I can see that my flip flop attire will be coming to an end soon. My little Jordan turns 10 on Wednesday!! Oh, how the years have flown by. She's getting all grown up now and when you're 10 it's all about the BLING! Usually I'm scurrying to make the girls a special birthday card but this year I'm on the ball and two days early! One of Jordan's birthday gifts is an outfit complete with a funky striped dress, headband, bracelets and this necklace, above. Jordan loves to accessorize and coordinate her outfits, so I thought a blinged out card would be fitting this year. I used lots of textures like the puffy SU! 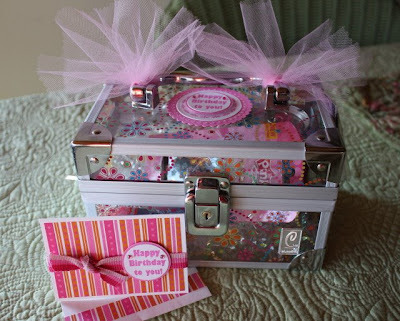 ribbon, the pearls, the textured Pinking Circles Nestabilities Dies from Spellbinder's, and the fun patterned paper from Crate Paper. 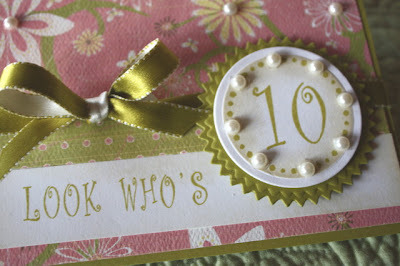 My card was easy to personalize for the big *10th* birthday (double digits are good when you're that young!). 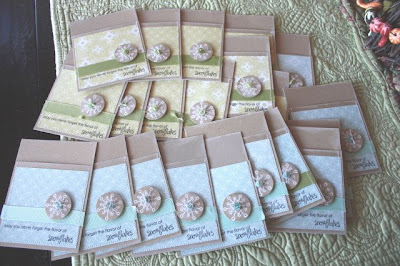 I reached for my JustRite Stampers Sonnet Self Inking set and my small rectangle and small circle wooden stampers. I chose to use the wooden stampers so that I could spell out my words in a longer format, and also use an ink pad in a color other than my black ink that comes with the self inking stamper. On the rectangle stamper, I spelled out *Look Who's*, and on the circle stamper, I used the fun polka dot border that comes with this Sonnet set along with the number *10* in the center. You can see my wooden stampers below, with the letters/numbers/border all arranged. And as I've mentioned before, if you lightly sand your images and then clean as usual you'll a get good, even coverage of ink. Many of you have asked the question, *What JustRite products do you suggest I start with as a beginner? * Okay, I have some suggestions, but of course you should base your first purchases on what your stamping needs are. My suggestions are just guidelines to help you get started. 1. Mass production projects such as monograms/wedding/anniversary/baby shower invitations, Christmas cards, etc. 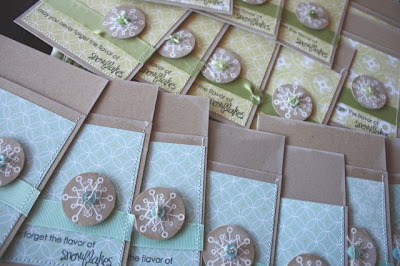 For these types of projects I suggest the self-inking stampers, and possibly some separate un-inked pads so that you can customize your ink colors. 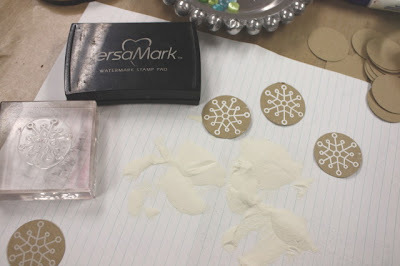 These products make quick work of repeated stamping. You can check out all of the Self-Inking Stampers HERE. Click on each link to see what borders, center and fonts come with each set. 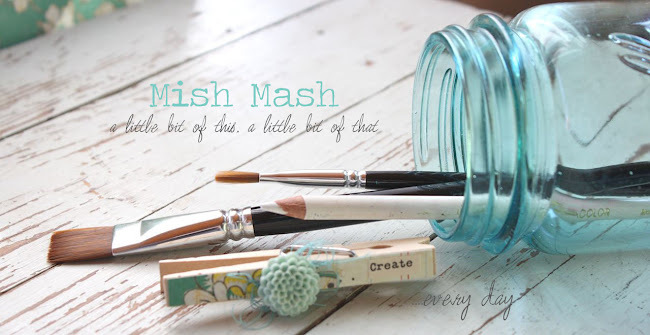 I also suggest the Small Alphabet so that you can make the tiny, customized border around the center stamped image. 2. General greeting card and gift giving projects such as birthday, baby, get well, etc. For these types of projects, I may use the stamped image only once or twice. 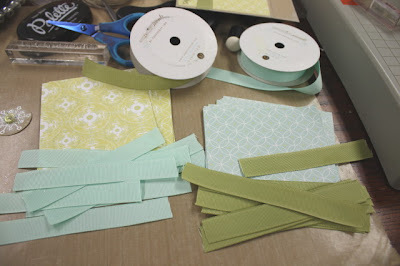 I will probably also want to match my ink colors to the colors of cardstock, patterned paper, ribbon, etc that I use. In this case, I will use a variety of Wooden Stampers, Border and Centers sets, Fonts and Borders and Alphabets and Numbers sets. If you want to start with some decorative borders and a font alphabet, check out the link HERE for the Fonts and Borders section of the store to see the variety of fonts and borders. Each set comes with a small wooden circle stamper too. If you want to customize your projects with certain themes such as Baking, Christmas, Baby or Birthday, then check out the link HERE for the Borders and Centers section of the store. If you purchase a starter set but then want to change out the fonts or add add numbers, check out the Font section of the store HERE. This is where you'll find the individual alphabets, number set and the small alphabet (the one that can go around as a border). 3. Spelling out longer words and phrases for a complete customized project. In this case, I'll reach for the wooden stampers, especially the longer rectangle wooden stampers, and an alphabet/number set. You can view all the Classic Wooden Stampers HERE. My best suggestion to get you started is to click on all of the links above. Then click on each, individual product link. This will show you more photos of the what the stamped images look like. You'll also see a complete listing of what all comes with a set, such as which fonts and in what sizes, what wooden blocks, what borders, etc. Have fun selecting your first JustRite products and let me know if you have anymore questions. Yesterday I had to make a run to town to get a birthday gift for Josey's friend. I thought she was going to her party today but then we found out that Megan wanted Josey to come over last night instead. I had to wrap Megan's gift lickety split so that Josey could go with her friend. They were meeting up at the high school football game and Eric was waiting in the car for Josey! JustRite Stampers to the rescue!! I stuffed all of Megan's goodies into the makeup case along with some iridescent scrunchy filler. Then I added some pink tulle to the handles. Now onto the box topper and matching card. I grabbed my 10 Designers Borders and Centers stamps and went to work. I used my 1-5/8" Classic Wood Round Circle Stamper to stamp the birthday sentiment on white card stock. I then punched that out and layered it onto a punched pink circle. 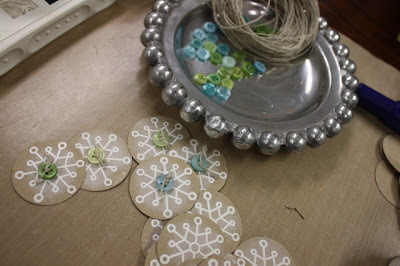 I added sequins around the sentiment and pop dots to the back of the layered circles. I then stamped the flower border on another piece of white scrap card stock. I used my Circle Nestabilities Dies to cut and emboss the circle. If you use two little snippets of Scotch tape to keep the die in place over the stamped image, you'll be sure to get a perfectly centered border image. I then cut and embossed a larger Nestabilities Scallop Circle. 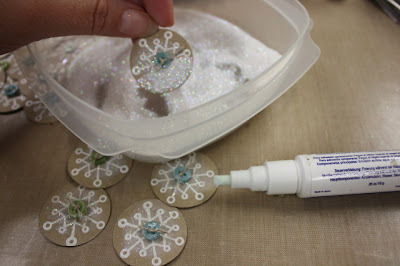 I used a white gel pen to add dots to the embossed scallops. I adhered all the circles together and used a pop dot to stick it to the top of the box. Megan can leave the embellishment on the box or take it off if she wishes. 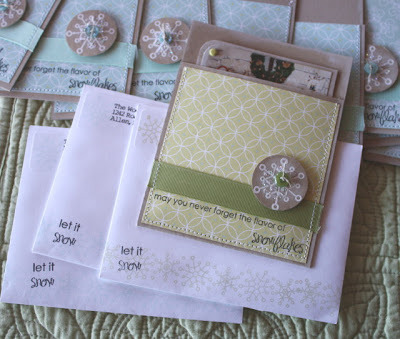 I used the same JustRite sentiment stamp to make a quick birthday card, using circle punches for layering. Josey had to fill the card out in the car on the way to the football game! I stuffed the makeup case into a gift sack with matching tissue and Josey was on her way!! Soooo, as all busy mom's do, we improvise! I couldn't let Megan's gift go unembellished. 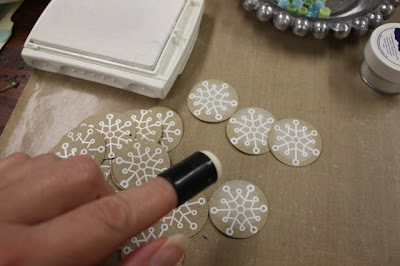 I love that as stampers, we can reach for our supplies and make quick projects. My girls have come to love all the attention that I put into their friends' and teachers little gifts. So keep on keep on stamping. Your family will always remember those special little touches.....JustRite touches in this instance! Edited to add: If you find that your ink is pooling on your stamp and you're not getting a good impression, I have a tip for you. Take a fine grit emery board or sanding block and sand over the rubber image. Then clean your stamp as you usually would. You can do this will all rubber images and you'll be amazed at the great ink impression you'll get. 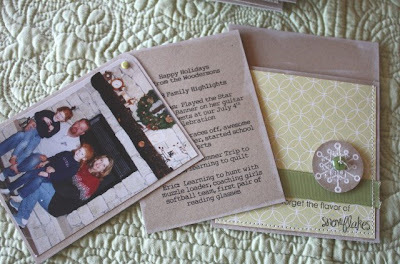 Edited to add: The script font I use for my recipe cards is CK Becky, a Creating Keepsakes font by Becky Higgins. You can to the CK website and download it for free. And you can find cheddar cheese soup in the soup aisle. The brand I use is Campbell's. Ready for a new recipe today? 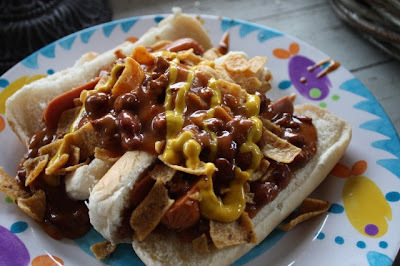 Every Fall I make these Bandito Chili Dogs. I think I got the recipe from a Taste of Home publication several years ago. They're perfect for get togethers or game days and the fellas love them! 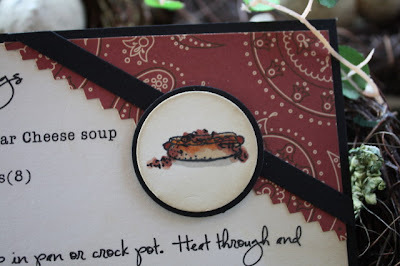 I couldn't resist making a recipe card (4" x 6") using Karen Lockhart's Itty Bitty Hot Dog stamp. Who knew a hot dog stamp would come in so handy!? I colored the hot dog image with Copic Sketch markers, using the *splotch* method....simply tap the tips of the markers onto the stamped image randomly. I splotched some chili off the side of the hot dog and then added a few little black dots with a fine tip Copic black multiliner pen for some texture. I used a grey marker to make a shadow line underneath the hot dog. For the patterned paper, I chose a bandanna print from a scrap from my stash of papers. I pinked the edges and added a strip of black card stock to give the circle a bold element to rest on. I then distressed the edges of the white cream card stock with Ranger Distress ink and an Ink Blending Tool. Easy peasy! 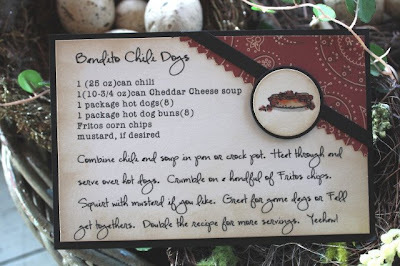 Here's a photo of the Bandito Chili Dogs below. And let me answer some questions that may be running through your head.....YES, I know these are not healthy, and YES I know how much fat and calories these contain(most of the time we use Light Hotdogs if that matters :). But they're SOOOO good and easy to make! Combine chili and soup in pan or crock pot. Heat through and serve over hot dogs. Crumble on a handful of Fritos chips. Squirt with mustard if you like. Great for game days or Fall get togethers. Double the recipe for more servings. Yeehaw! I hope you all have a great weekend! I'm off to wrap Jordan's birthday gifts, prepare treat sacks and plan some games. Gotta make a run to town to purchase a gift for birthday party Josey is going to..might stop by the quilt shop also just for fun. Have a great weekend everyone!! I have another Halloween card for you today. I'll have to make it short and sweet because I need to get to get ready for work and company that will be coming tomorrow. My stamp image is the Itty Bitty Witch's Hat from Karen Lockhart. I colored it with Copic Sketch markers on an Inchie Art Square. 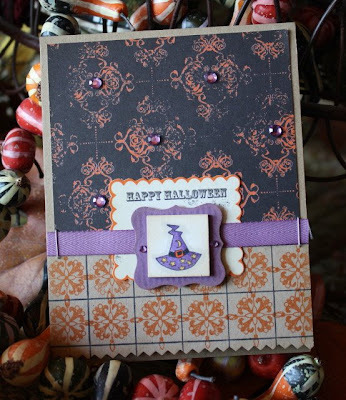 Patterned paper and Happy Halloween label are from Making Memories. 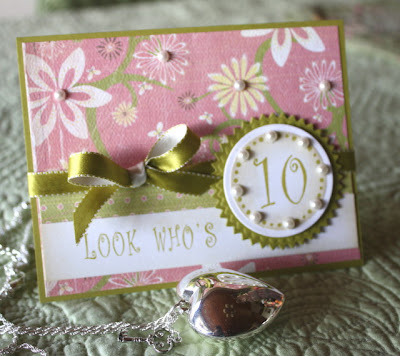 Purple sequins were added to the centers of the design elements on the patterned paper. 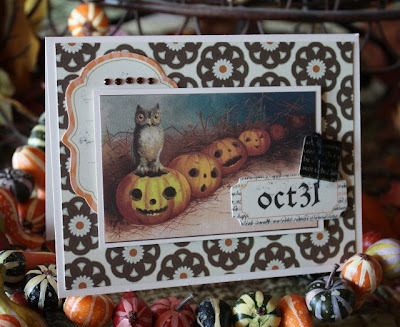 Bottom elements were stamped from Papertrey's Guidelines stamp set in Pumpkin Pie SU! ink. Purple ribbon from Papertrey Ink. What are you plans for Halloween this year? I'm hoping to get my decorations up as soon as I find some spare time. It's a great time of year to get spooky! October is just around the corner, which means Halloween will be here soon. I can't wait to decorate with some of my new Halloween goodies I've found. I'll post pictures when I get it all done. 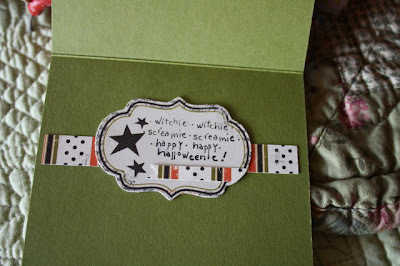 In the meantime, I've begun to make some Halloween cards. 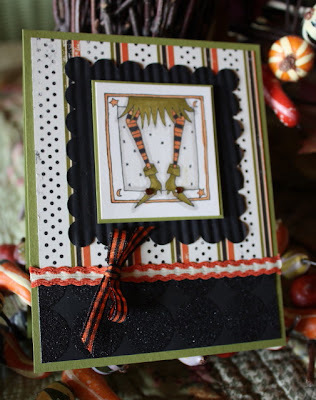 This card uses Karen Lockhart's Witch's Legs stamp. The striped legs and the funky, pointy shoes just crack me up! I colored the stamped image in with Copic markers, the very fine tips of the Sketch Markers come in very hand with a detailed stamp like this one. 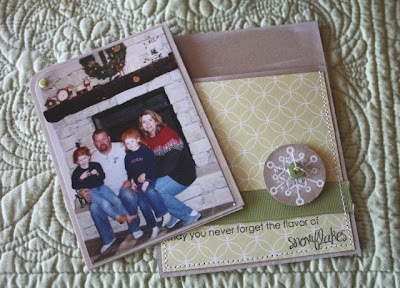 I added sequins to the shoes and layered my image onto a scallop cut Spellbinders square die. My background papers are from Making Memories, some of my favorites for Halloween projects. Both ribbons were Archiver's finds. Check out this angle to see the glittery patterned paper from Making Memories. 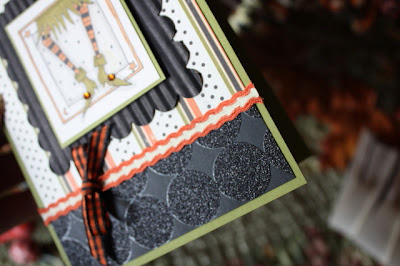 I also ran my black scallop die through my Fiskars Crimper to add texture. I embellished the inside of my card too. I stamped the Lockhart *witchie, witchie* sentiment on a Making Memories label, added a little snippet of leftover patterned paper and adhered it over another strip of leftover patterned paper. FUN stuff ladies! Today my friend Carmen is coming over to make Halloween goodies for teachers and friends. We like to get together for each holiday and mass produce. We're just going to combine all of our Halloween papers, ribbons and packaging and see what we come up with. I'll be sure to take photos....especially since Carmen has the most beautiful fingernails and jewelry. She'll make a good hand model for me! Jordan's birthday is coming up so it was time to make the invitations. She loves to have her party out in the timber behind our house. At a glance from our back deck, you see nothing but trees. But once you cross a bridge and enter the timber, it's a wonder land for kids! We've cleared out a big area for the kids and have added a tree house, a tire swing, forts for paintball, a fire pit and a hammock. It's great fun! For Jordan's birthday, we always do a nature scavenger hunt, chop wood (the boys LOVE that!) and have a weenie roast complete with S'mores. Jordy likes to invite both her girl and boy friends, so we tend to keep the invitations neutral in theme. I started the invitations out with a S'more stamp from SU!, the JustRite Stampers Brayton alphabet font and the small alphabet set. For the focal point of the invites, I used a round wooden stamper and the Small Alphabet from JustRite Stampers to spell out *time for s'more fun*. I was able to customize my stamper exactly the way I wanted to and it matches the s'mores perfectly! For the s'mores I used some Liquid Applique and burned it with my heat tool. 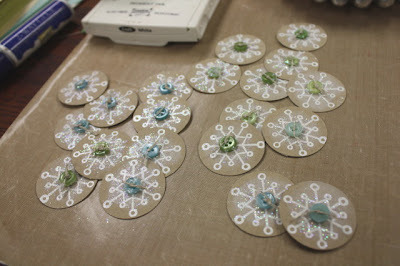 The circles were cut and embossed with a Spellbinder's circle die template. The s'mores were colored with Copic markers. They look real, Jordy loved that part!! Then for the pocket insert of the invitations, I used the Brayton font with a wooden rectangle stamper from JustRite. I spelled out *you're invited* and stamped that on the top portion of the insert. 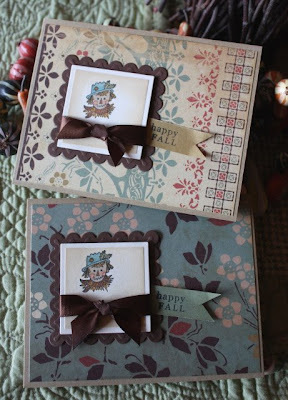 I created a pocket card invitation using brown card stock and Cosmo Cricket's Happy Camper patterned paper. Stitched ribbon is from Papertrey Ink. I typed the rest of the invitation on the computer. I like to include the activities that we'll be doing at the party so that the kids will know to wear old clothes. Nothing fancy here, just a good ol' time....getting dirty....getting back to nature. Here's the little pile of the invites. I can't wait for Jordan's party!!! How about some His and Her get well robes? 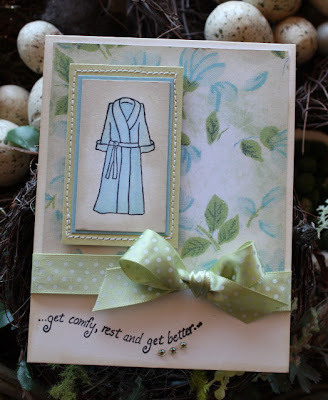 I needed to fill up on some Get Well cards in my stash basket and Karen Lockhart's Robe stamp came to the rescue. I love how it's gender friendly...I can use it for male or female cards. It can be colored, like I've done with my awesome Copic markers.....it can be paper pieced with male or female like patterned paper.....you can add plaids, stripes, polka dots......the possibilities are endless! Here's my female Get Well card, using Melissa Frances patterned paper, Papertrey Spring Moss ribbon and a Karen Lockhart sentiment. 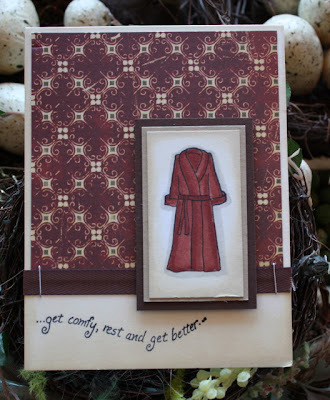 And here's the male version of my Get Well card, using patterned paper from Cosmo Cricket and twill ribbon from Papertrey. And I don't know about you, but the head colds and allergies are acting up around here like crazy. I've been needing lots and lots of Get Well cards! I hope today finds you feeling GREAT!! Sometimes it's just fun to grab a bunch of supplies and see what you come up with. That was the case with these two cards. I had a bunch of leftover supplies sitting out so I decided to just have some fun. I used Alli's Garden of Life stamp set from Papertrey. The swirly stamp and the solid image make the most fun flower, one of my all time faves. For both cards, I used PTI's Stamper's Select White Cardstock for the base card. Ink colors were PTI Dark Chocolate, Aqua Mist and SU! 's Old Olive. The strip of patterned paper along the bottom of the cards is PTI Chocolate Remix and the polka dot green paper is from October Afternoon. The embellishments were the most fun! I usd snippets of my ribbon finds from Archiver's along with some stitched buttons that I turned into flower buds. I used Papertrey's Leaf Ribbon to make cute little leaves for the flowers. 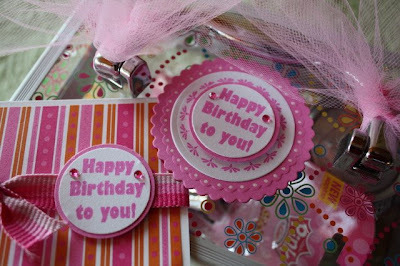 So cute, I love that ribbon and want to use it on everything!! I you all have a fabulous weekend! We're enjoying the beautiful weather here in Kansas and I hope Mother Nature calms down a bit for those in all the stormy weather! We're headed to the high school football game tonight then Jordan and I are leaving at 6:30 AM tomorrow with my mom. We're meeting my sister at the big arts and crafts show this weekend. We look forward to it every year! Josey's hanging out with dad as she doesn't care for this kind of entertainment! All of the fun ribbon that I've been using lately that is not from Papertrey is probably from Archiver's. I purchase it by the yard and many of the brands are May Arts, Maya Road and Making Memories. The three tierd basket that I use for my centerpiece decorations is from a shop in Atchison, Kansas called Nell Hills. It's so awesome!! The new little shop I found that is fun to visit is called the The Nesting Place and it's located at the Lebo, Kansas junction of I-35 and the Lebo exit. Such a cute little place to visit. Each season, the interior is painted a new color and they totally make over the shop. I could visit it every day! Yes, you can use your Cuttlebug with the Nestabilities. Nichole has a wonderful tip sheet of all the *sandwich* combinations that will work with your machine. Just link to the Nestabilities section at the Papertrey website and the information is right there. Yes, I do sleep. I get all my work done while the girls are at school on the days I don't sub. I work pretty fast and try to get it all done so I can be at the girls' activities at night, pick them up from practices and fix supper for my family. It's all great fun and I enjoy every minute of it!! My friend at the high school switched jobs this year from being a history teacher to the school librarian. She's been working hard getting the library all organized this year. 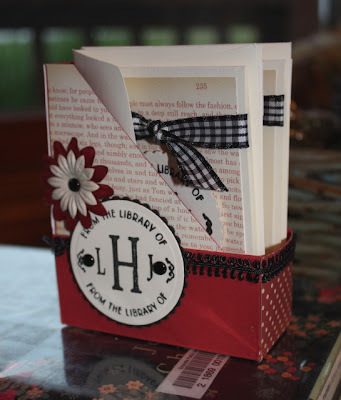 Her birthday was last week so I made her a little gift...library themed. This is a little mini magazine holder. I got the template HERE from Becky Roberts' blog called Inking Idaho, such a fun idea!! I used my Just Rite *from the library of* border stamp and the Times New Roman alphabet for the initials of my friend. 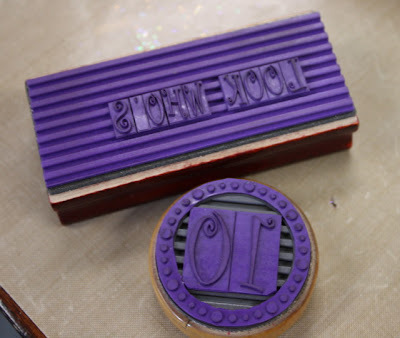 I used the small wooden stamper to hold my border and alphabet stamps. What perfect stamps for a librarian!! I decorated my box with Jenni Bowlin papers, vintage looking black ribbon and some Prima flowers. The size of the box is just perfect to hold a few small notecards. 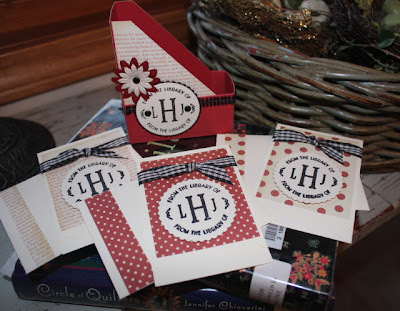 I used more papers from Jenni Bowlin, some black and white gingham ribbon, Spellbinder's scallop circle dies and the same monogram stamper and border for the notecards. My friendLOVED her little gift! Edit: The flecked look of ink over the pear image was done with a marker and SU! 's spritzer tool (I can't think of the technical name of the tool) . You could also use the Copic Airbrush System with a marker to achieve the same affect. Just one little spray is all you need. Jordan asked me all summer...."Mom, have you ever had pears with honey?" I kept telling her no, I'm not a real pear fan. She said they were awesome and that Grandma Anne fixed them that way for her, straight off her pear tree. Then finally when the pears were ripe this summer, I got Jordan some Bartlett pears. We cut them up and drizzled on some honey. Oh were my taste buds happy! This is such an awesome snack, almost pretty enough to be a fancy dessert. 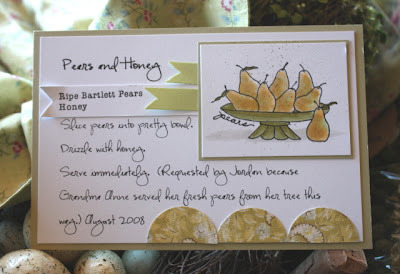 I had to make a recipe card for Pears and Honey, not because I needed the recipe really, but because I wanted to remember Jordan's little story. I used Karen Lockhart's Pears stamp and colored all the pears with Copic Sketch markers, using a stipple type brush stroke. I just dotted the colors on instead of coloring neatly. This is what gives the pears that splotchy, sun kiss look...zoom in to get a better look. Patterned papers are from Wild Asparagus, just punched circles cut in half. Ribbon is Spring Moss from Papertrey Ink. 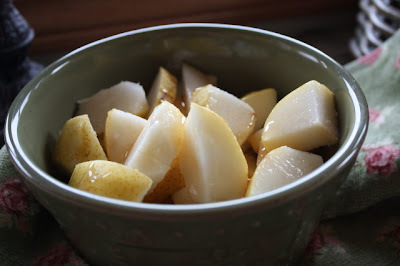 If you haven't tried pears with honey, add it to your list this week. Yummo!!! The merriment continues at Papertrey Ink! The entire PTI Design Team has blog posts about their favorite holiday tradition. 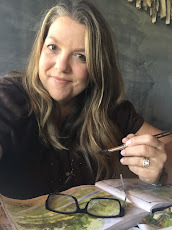 Be sure to visit Nichole's blog for all of the links. One of my family's favorite holiday traditions is making and decorating sugar cookies. I usually make a homemade sugar cookie recipe and frosting, but sometimes the need arises for something quick and easy. Plus the girls thought it would be fun this year to invite some friends over for a cookie exchange. 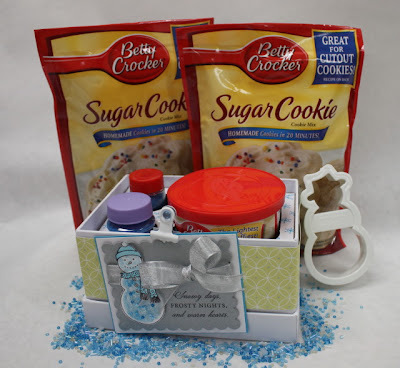 I thought these Snowman Sugar Cookie Kits would be fun! Each guest would receive a decorated PTI Egg Box that holds a jar of frosting and two separate jars of sprinkles....a snowman cookie cutter......and some Sugar Cookie Mixes. 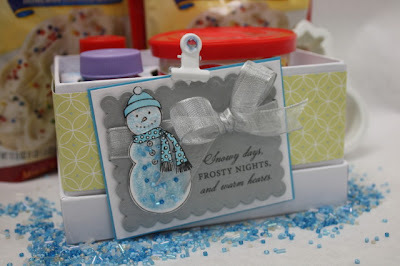 For the front of the box, I used Nichole's Made of Snow stamp set. 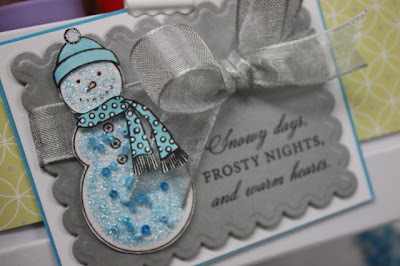 I stamped the snowman using the stocking cap and then paper pieced a polka dot scarf. To simulate our real sugar cookies we made for samples, I used some baby blue Stickles for frosting and some blue seed beads for sprinkles. I popped the *cookie* up on a metallic silver Spellbinder's cut rectangle. I thought this resembled a metal cookie sheet. Here's the closeup of our *cookie* snowman, the new silver card stock and the beautiful Silver Sheer Ribbon released this month. For the lining of the box, I used my craft knife to join four of the circles into one big square. 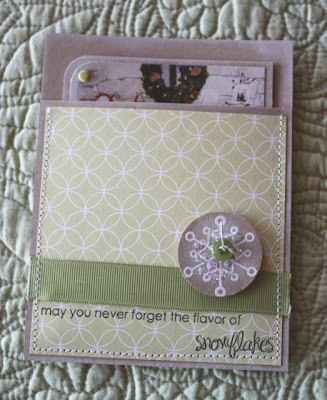 I then stamped the chipboard lining with Pine's new Rustic Snowflakes. Two jars of sprinkles and one jar of frosting fit perfectly inside. The lid does not fit on top so I just tuck it under the box. 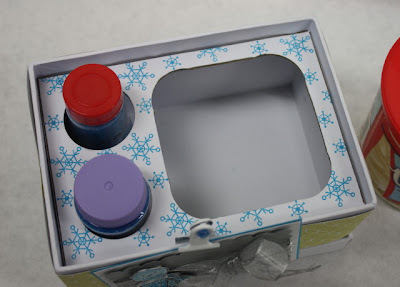 After the frosting and sprinkles have all been used, the box can be used for a Christmas decoration, a gift box or maybe to hold some small ornaments. 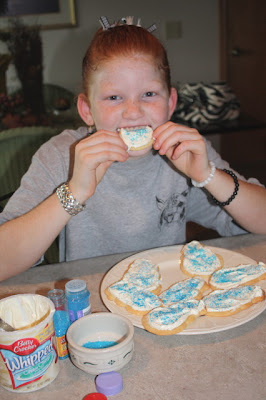 And here's Miss Jordan, sampling the snowman cookies we made. Poor Josey was at volleyball practice this particular afternoon so she got one cookie I think! Eric came in shortly after this photo was taken and the cookies vanished!! But never fear, the cookie dough and fixings will come around again come December. There's nothing better than being snuggled in our home, listening to Christmas music (Jordan singing Feliz NaviGOD..LOL) and baking cookies with my family. These are the days that memories are made of. Made of Snow stamp set, Rustic Snowflakes stamp set, Egg Box, Silver Metallic Card Stock, Silver Ribbon, Everyday Blessings Patterned Paper, Spellbinder's Rectangle Die Template.